You can say I’m biased, partial or plain one-sided, but in my opinion Cynthia Eden writes the best paranormal that I’ve ever come across. Vampires, Demons, and all the other known paranormal is known to exist among us. Just like us humans faced with the good, the bad and the ugly, so does the paranormal realm. And the evil is sent to Purgatory, a place where the evil of the evil are prisoned forever. 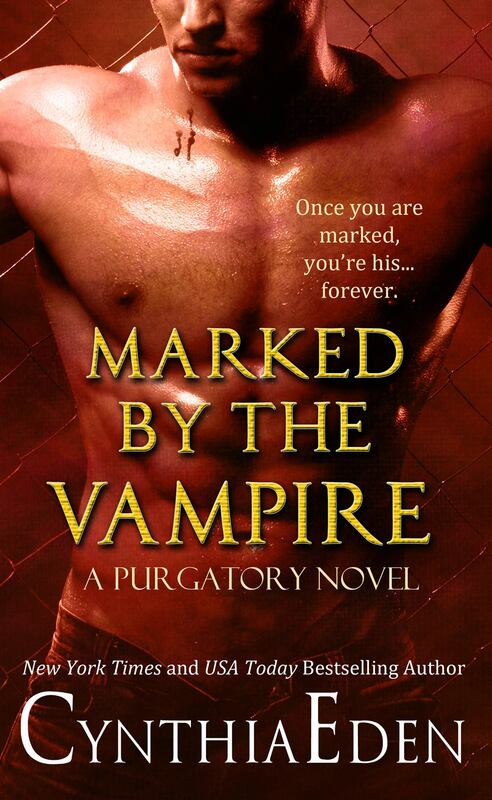 Cynthia Eden’s second release in her Purgatory Series, “Marked By The Vampire”, takes us up close and personal with Shane August, an FBI agent and Dr. Olivia Maddox. Shane is one of a kind, super powerful vampire working undercover to infiltrate Purgatory to bring light to strange and dangerous experiments being conducted. Olivia is sent on the ride to study the reason some vampires turn deadly versus others who remain good. The clash of a vampire and a jinnh is a magical thunderbolt and the mating of these two is astronomically addictive. Even as Shane and Olivia try to discover the evil behind Purgatory, betrayal and unknown forces are at play trying to burn these two to ashes. Olivia struggles to find herself and accept her identity and Shane puts his life at stake for the love of his life. With all the adrenaline and evil surging on Purgatory, betrayal and double-crossing in play, lust and passion weaving its magic around Shane and Olivia, surviving seems to be just out of a finger’s reach and the beast within is waging a victory. Another outstanding creation from Cynthia Eden!!!! Non-stop action, unpredictable situations, desires as dark as the night, lust as thick as fog and trust put to the ultimate test, this is one book you don’t want to miss.